The 1840 New Orleans quarters are, like all 1840 New Orleans seated coins, amongst the most interesting issues of the series. All five die pairs of 1840-O were high on my want list from my very first day as a “serious” variety collector. It was very clear that the 1840-O with drapery large O was going to be both tough to find and expensive. What was not at all clear was that the 1840-O with drapery small O Briggs 1-B would be even more difficult to find than the large O variety. 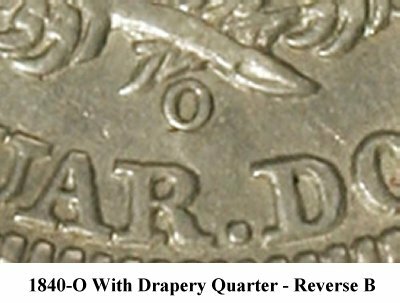 During the time that I have pursued this collection I have seen, purchased or been offered more than twice as many with drapery large O quarters as small O reverse B examples. Reverses B and C of the 1840 with drapery small O quarters are illustrated in Figures 1 and 2, respectively. The mintmark location is distinct enough that coins can be attributed without magnification. 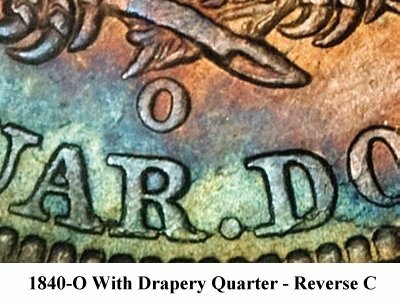 Since 1999, when Heritage began placing photos in their online archive, they have sold 66 examples of 1840-O with drapery small O quarters in all grades. Nine of those (13.6%) were die pair 1-B. Starting with the example sold as part of Larry Briggs’ private collection in 1999, six 1-B examples were offered over seven years. Interestingly, from 1999 – 2005, 6 of 22 coins (more than 25%) were reverse B. The total of 22 examples over a period spanning 7 years does represent a very small sample size, though, and the drought really began in 2005 – coincidentally just as I started looking for them. Since January of 2005 Heritage has auctioned 44 examples of the 1840-O with drapery small O quarter. Only three (6.8%) were the Briggs 1-B die pair and two of those had significant problems (and were slabbed as such). The last problem free example of the 1840-O Briggs 1-B sold by Heritage at auction was in September of 2006. The first example of the Briggs 1-B that I found offered for sale was that very same coin in the September 2006 Heritage Long Beach Sale. It was in an NGC AU58 holder, and after well over a year without finding a single example in any grade, I chased it with some determination, only to be outbid. Five months later I did acquire an AU example with a really nice strike and surfaces – except for a staple scratch near the rim from 1 to 3 o’clock on the obverse. Though pleased to have even a damaged example, the coin remained on the want list. It would be more than four years before the next sighting, a choice VF example that turned up on EBay, and as of March 2012 I have seen, bid on, or purchased a total of seven examples in seven years – including two problem coins sold by Heritage. Briggs’ does not comment on the rarity of the 1840-O with drapery 1-B die pair in his book. My extensive search for an example and a quick look into the Heritage archives indicate that it makes up around 10 – 15% of 1840 with drapery small O examples and is a rare, or at least a very scarce, die pair.